So I take Bugs to what will probably be my last drive of the season with my Club. Once daytime temps are in the 40s range, I wimp out. At the drive is an older gentleman who I know has a pair of Drafts he drives. This time he has brought an roany horse, put to a lovely burgundy Gig-style cart. Ever since before I got Bugs I have drooled over a spindleseat Gig shown in the carriage guy's flyer. Went as far as to ask him on my last visit how much for a mini-sized version. His work is lovely & includes custom paint & pinstriping as well as your choice of fabric seat - so not overpriced, jist not cheap. I compliment him on it & Lo & Behold! He tells me he built it himself after seeing one at a show & asking owner if he could take measurements. He is willing to measure for me & says it would take "a few months" to complete. I did not ask price, but I am certain it will save me $$$ over the carriage guy. 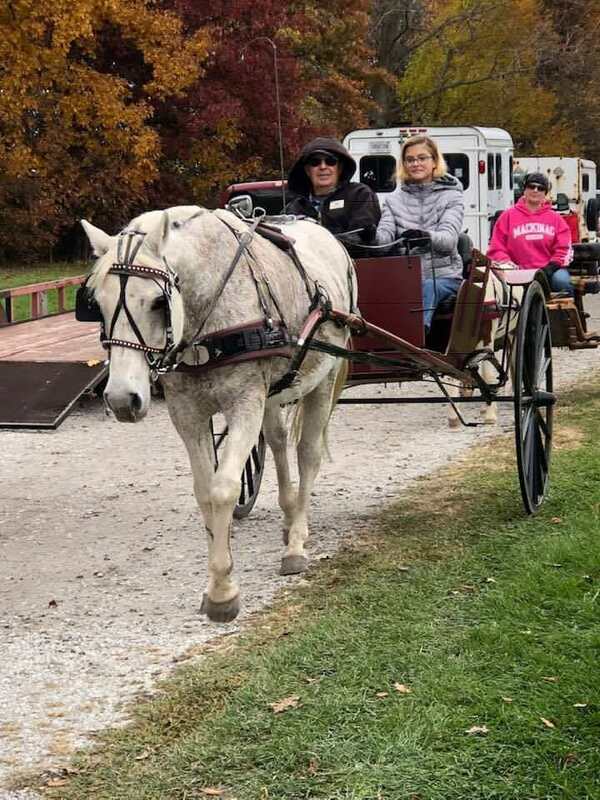 This would be mainly a show cart for me, although he was driving on County Park trails - well-maintained, but not hardly arena footing - I might take it on drives occasionally. Time for me to go on the Ramen Diet to get this cart for me & Bugs? Last edited by 2DogsFarm; Nov. 6, 2018, 05:35 PM. You may want to talk weight saving changes. Gigs were road vehicles, UK built ones tend to be heavy with their woods available there. American gigs can be lighter, but still tend to be solid, heavier than other cart styles. Stay AWAY from Oak, it is heavy,dead weight in a vehicle. With your small animal, the chance of heavy ring surfacing, deep going, could stop you dead driving a gig. Saying this because I watched it happen in the local 4H fair ring. Halt, line up, then back to the rail for individual test and the mini could not move his little Meadowbrook. Driver had to push the wheels like a wheelchair to help get going! Mini was no quitter, reared and lunged forward, but ineffective until driver pushed the wheels. This was a 36" mini, not tiny. Ring surface was deep, WELL dragged for the speed horses, way to deep for any driving horse. Our big FIT horse was very tired moving his really light carriage in that deep going. I got permission for all driving classes to move to a grass ring in the following years. No wheels sticking in the dirt out there! So if the guy could use light, flexible woods in the gig, wheels, you could have a lot of fun driving it. Might be the pleasure drive vehicle of choice on roads or hard surfaces. You just need to keep vehicle weight way down, so your weight and vehicle total do not outweigh the animal. goodhors Yup, weight would be foremost. Our County Fair is notorious for craptastic footing in the one & only arena. Made exponentially worse by having Reining classes go first, before Drivers. In there I hug the rail or search out the lesser-used track to the inside & even then Bugs can struggle. Other local places either show on grass, or at least don't have other classes besides driven. If I get to the point where I am planning with my older gentleman I will stress the need for saving weight w/o sacrificing safety. Aside from that, will me being seated a bit above rather than directly behind mini need to be addressed? Most antique carts had you slightly above the driving animal for visibilty. Meadowbrooks, that cart family are the exception. Modern cart design, especially inexpensive metal carts, seems to ignore this design idea. There is a ratio of axle width to vehicle seat height, for reducing tippiness in higher seating. Not sure what it is. Maybe the CAA folks could help you with that. Cart axles are always wider than 4-wheelers, to prevent tipping. Vehicle weight should be in the wheels and heavy axle, low down. I think seat height, even if not much, may just be something you need to get used to after your easy entry cart use. I personally LIKE being above my horse, seeing forward to where we are going. I hated having to lean sideways in the sleigh to see ahead. Not much of a view seeing breeching, mid-tail of our tall horse! Not comfortable leaning out sideways, leaves you getting surprised not seeing things ahead. SOLD the cutter, not fun to drive it to the tall horse. It had been great fun with the smaller 14.2H horse, we could see everything ahead. All our vehicles have a higher drivers seating. goodhors Even though I am a towering 5'5", seated in the EZ-Entry I can see over Bugs 34" rump. My wood show cart does have a slightly higher vantage point, but not by much. So the visual advantage won't be apparent in a higher-seated cart. The Gig I saw did have wheels wider than base of the cart, so axle s/b correct length. I will check ADS/CAA sites for seat-height-to-axle ratio & keep that measurement in mind when I get to Talking Turkey. ETA: ??? Odd, now the pic is back, maybe just my phone? I just got a cart that seats me a little higher than my first easy entry cart and the first time I drove it I was all afloat. After five or six drives I adapted and now it feels fine to me. You will adjust to the difference . I now have a lot more leg room and it is awesome! I know one reproduction Gig with bad proportions. Axle is too narrow for the seat height. Have seen it almost go over more than once! Heard it HAD gone over at other driving venues. So best to KNOW the ratios, not everyone shrinks or enlarges things proportionally. Whoever built that tippy Gig missed the correct measurement on the axle width. Have to say we were all ready to hop the fence in case it tipped, every time they went in the ring! Husband was riding as groom with daughter, told driver to stay away from them because driver also appeared to have little control of fire breathing pony. It worked, they did keep away! With Bugs being small, I knew you could see ahead in the easy entry. Back to proportions, he is smaller than fits your seated height. So some parts may need tweaking to have the vehicle work well, give you good seating, needed footroom for comfort. I can't see your picture either. Do you have a side view too? goodhors Nope, just this one. This cart is way too small for the horse. It looks way tipped up while a gig the shafts should be level. Years ago in my driving days, I picked up a gig at Martin's auction. It was lovely. But frankly I did not like sitting that high and on anything other than level, I felt very much like it could go over. Only kept it a year or so then went to a 4 wheel. ^^^ This is why I liked my easy entry carts. I drove ponies, one pretty small and one bigger but with very low head carriage. I didn't mind occasionally craning my neck to see around them the few times they turned into giraffes.